Fry the fish first. Set aside. Saute the garlic, onion, ginger. Add the carrots. Add in vinegar and soy sauce. Let it simmer for a few minutes. Add salt and pepper to taste. Add in the mixture of water and flour to thicken the sauce. Simmer for a few more minutes. Pour it over the fish. Best served with steamed rice or fried rice. 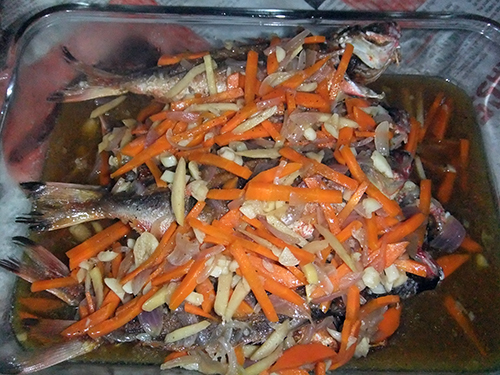 This entry was posted in Recipe, Sea Food and tagged fried dalagang bukid, Fried fish, sweet and sour dalagang bukid recipe on May 20, 2015 by Yami.